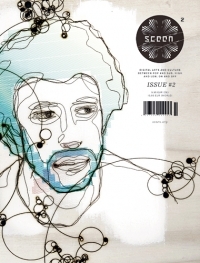 SCEEN is a magazine for digital arts and culture that thrives on exciting technology and extraordinary ideas. On the edge with the current upsurge in media arts, where young artists eagerly explore new possibilities and naturally dissolve artistic boundaries, SCEEN compiles a fascinating mix of insights and outlooks in the fields of creative coding, generative art, VJing, AV performances and installations, demoscene, machinima, 2D/3D animation, netaudio, micromusic, circuit bending, game and media arts - and everything in between. In the second issue (100 pages), SCEEN meets the London based VJ/DJ/AV ensemble ADDICTIVE TV (UK), generative artist and Generator.x founder MARIUS WATZ (NO), 3D animator and filmmaker ROBERT SEIDEL (DE), Wiimote DJ/VJ DAITO MANABE (JP), the STRUKT VJs ANDREAS KOLLER and TANJA TOMIC (AT), the leading demogroup ASD (GR), the guys behind the netlabel 1BIT WONDER (DE), 8-bit/reggae crossover artist DISRUPT from JAHTARI.ORG, the 4 kilobytes microfilm coder MINAS (DE), Machinima Festival founder FRANK DELLARIO (US), the Tekken theatre performers from GOD'S ENTERTAINMENT (AT) and many, many more. The attached SCEEN video DVD features more than 3.5 hours of audio-visual works, animationed shorts and music videos resembling the editorial content of the magazine. A proper data track holds an exclusive demo of the VJ tool SCULP and executable data for the featured real-time animations (demos) and game mods (machinima). Magazine and DVD together are a beautiful selection, reference and manifestation of remarkable digital wow-moments - between pop and sub, high and low, on and off.